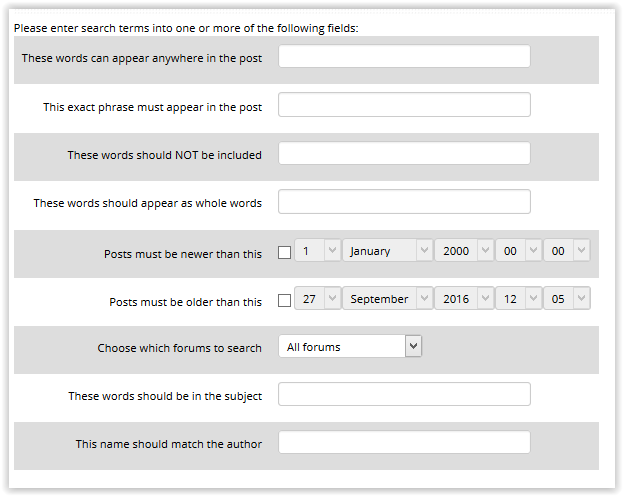 The Search Forums Block allows users to search existing forums within a course for a specific word or phrase mentioned. It also provides the options to "Advance Search." NOTE: At least one forum must be added and responses recorded in order to use the Search Forums block and the Advanced Forum Search features. See Moodle 3: Activities & Resources: Add a Forum on how to add a discussion forum to a course. 1. Log into your Moodle course and click Edit at the top right of the page to turn editing On. 2. Locate your Search Forums block. (See: How to add the Search Forums block). 3. Select the Advanced Search link under the text box. These words can appear anywhere in the post: This functions in the same manner as the Search field. Type one or more words to search of the forum posts in which they appear. This exact phrase must appear in the post: This option searches for an exact phrase within a course forum post. These words should NOT be included: This option can be used for particular words you wish to not be included in the search. Posts must be newer / older than: This option narrows the number of forum posts according to time limits. Choose which forums to search: This allows searching within a certain forum. These words should be in the subject: This narrows the number of posts found to the text within a subject. This name should match the author: This options allows searching by author or username. 5. After entering the desired information, click Search Forums at the bottom of the page.